Hands down, breakfast is my favorite meal of the day. It’s the only meal that tastes great at any time of the day – morning, noon, evening. Take this raw grain-free granola, for instance. You can have it with almond milk or coconut milk for breakfast, sprinkle it on top of a smoothie bowl for lunch, or use it as a topping for your yogurt as a snack. Genius! It’s hearty, filling, energizing, caramel-y, and slightly nutty. What I love most about this raw grain-free granola is how crunchy it is. I’m talking about a crunch that you can actually hear in your head. While this might not be a big deal for you, crunchiness is something that either makes or breaks the deal for me. As much as I love smoothies and oatmeal, they both lack one important thing: a nice crunch. No matter how much of these foods I eat, I always end up grazing the pantry for nuts, seeds, or even cacao nibs afterwards. At one point I thought I was being ridiculous and decided to stop buying nuts and seeds altogether. Not much of a help as I ended up crunching on raw carrots and sliced cabbage instead. If you think that I’m going a little overboard with all the crunching here, keep reading. According to neuroscience, what you hear when you bite plays an important role in your experience and enjoyment of food. It turns out that crispness and pleasantness are highly correlated when it comes to our rating of foods. Crispiness is a flavor quality. Once you realize how important the sound is to the overall multi-sensory experience, you stop wondering why food marketers focus on promoting their products on the basis of crunchiness, crispiness, and crackly sounds in their advertisements. Think of all the labels screaming at you “extra crunch”, “exceptionally crunchy”, “stays crunchy even in milk”, or “the crunchy way to say, ‘I love you’”. Food marketers even developed a sophisticated apparatus to measure the perceived level of crunch that consumers hear in their head. See? I’m not the only one craving some crunchiness. A great thing about this grain-free granola is that you can easily swap out any ingredient. If you’re allergic to nuts or want to make this recipe more cost friendly, use seeds instead. If dried fruit isn’t your thing (in which case we need to talk! ), use more coconut. Just make sure that you replace the same amount of dry ingredients for dry, and wet ingredients for wet. Mix and match and voila – you just made your own granola. A quick note about the nuts and seeds – while it doesn’t really matter what type of nuts and/or seeds you use, it’s always good to use at least two different varieties. I used almonds and sunflower seeds in this recipe. However, hazelnuts, macadamia nuts, pecans, and sesame seeds would be amazing as well. When pairing the nuts and seeds, use one kind that is on the harder/crunchier side (e.g. almonds, hazelnuts, pumpkin seeds . . .) and one kind that is on the softer/chewier side (e.g. pecans, sunflower seeds, walnuts . . .). All nuts and seeds contain a phytic acid and enzyme inhibitors, which interfere with the body’s ability to absorb nutrients. While many traditional cultures naturally soaked or sprouted nuts/seeds, this practice is not longer common, particularly because it’s time-consuming. It is, however, simple and inexpensive and can greatly increase the nutrient content of the nuts/seeds you consume. All you need to do is soak the nuts/seeds for 8 – 24 hours in a simple mineral solution (like salt). Then drain and rinse the nuts/seeds and place them on a kitchen towel to absorb excess moisture. The easiest and fastest way to chop all the nuts and seeds is to use a food processor. Another benefit of using a food processor is that it creates same-size pieces so the granola bakes evenly. If you’re using nuts/seeds that are similar in size, you can process all the nuts/seeds at the same time. However, if you’re combining bigger nuts (e.g. almonds) with smaller seeds (e.g. sunflower seeds), you’ll want to process the nuts first, so the seeds don’t turn into a powder. Raw grain-free granola that is crunchy, hearty, filling, energizing, caramel-y, and slightly nutty. Raw version: set the dehydrator to 115°F (46°C) or set oven to a dehydrator setting. Baked version: preheat the oven to 300°F (150°C). Chop the nuts and seeds (if using bigger seeds) to an approximately same size. You can either use a food processor or a knife. Add the coconut and mix to combine. Combine all the wet ingredients. Pour the wet mixture into the dry ingredients and stir well. Spread the granola evenly onto a dehydrator tray/baking sheet. Raw version: dehydrate for 10-12 hours (in the dehydrator) / 4-5 hours in the oven until dry and crunchy. Baked version: bake for 30 minutes or until golden. Stir the granola every 10 minutes or so to prevent burning. 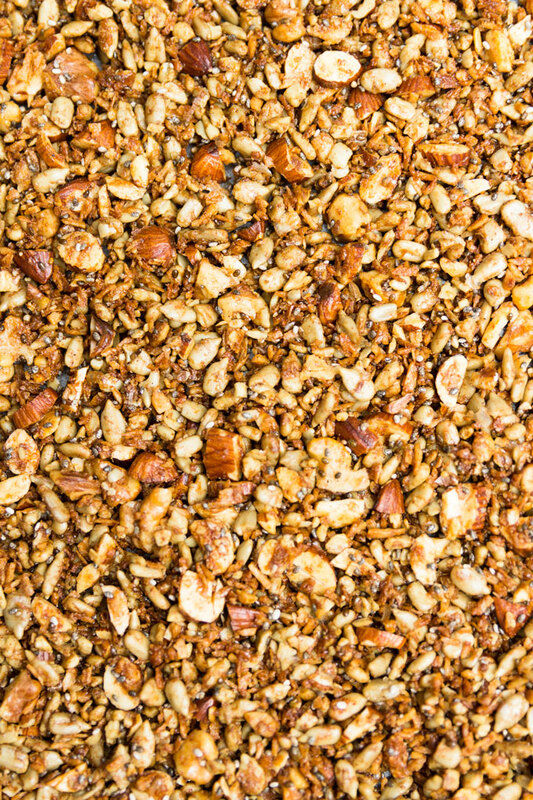 Store leftover granola in an airtight glass container on the counter for up to 6 weeks. For longer term storage, freeze in an airtight container for up to 3 months. *For raw granola, use raw unhulled sesame seeds. Unhulled sesame seeds are very crunchy, almost hard, and taste slightly bitter. Toasted hulled sesame seeds (not raw), on the other hand, have a nutty, clean flavor. **Add the dried fruit into the granola only after the granola has been baked/dehydrated. Dried fruit burns easily when exposed to high temperatures. What brand oven you use? What can you use instead of the coconut oil ? Thank you for your videos and recipes. The videos are all very tastefully done, and your husband’s candid reviews give me confidence to try some of the recipes for my own family. I’d like to make this granola recipe but cut back on the sugars. Is the quantity of maple syrup necessary to the texture, as well as the taste? Hi Petra- I ran across your videos for flaxseed wraps and psyllium flatbread, both of which I am very excited to try – thank you for sharing your wisdom in the kitchen – I am in my 50s, have had a lot of issues with sugar, and have been seeking to make some kind of granola that has NO sugar – just oil – even if it means adding something like stevia or erithritol, etc. Can granola be made entirely sugar free? I have had some early indicators of heart disease and know that sugar including natural sugars like maple syrup are basically on the “no eat” list for me if I can possibly avoid them. Thanks. Welcome to Nutrition Refined 🙂 Yes, it can. Have you ever heard of monk fruit sweetener? Monk fruit is a natural sweetener which, technically speaking, contains calories and carbohydrates like other fruits and vegetables. However, these fruits are not commonly consumed fresh. After drying, the trace amounts of fructose, glucose and other components are considered insignificant. Would that work for your diet? 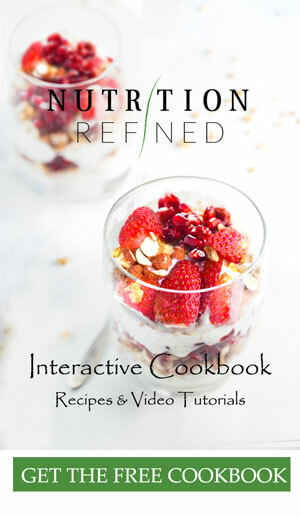 You can check it out here: https://nutritionrefined.com/lakanto-syrup (please, note that is it an affiliate link). If that doesn’t work for you, you could use any other sweetener of your choice (ideally liquid). Thanks Petra – yes, I actually saw the Lakanto syrup at a local health store but purchased the granulated same sweetener at their competitor. I am going to see if melting the coconut oil and the granulated sweetener in a pan on the stove on low heat will work, then try it and see how it goes. Thanks again for your blog. Yes, you could definitely give that a try 🙂 You probably know this, but just in case, the sugar will not dissolve in the coconut oil. It’s not a problem, but just wanted you to know that. Sugar is a polar molecule and oil isn’t (sugar only dissolves in polar solvents, such as water).